cantu pest control goes above and beyond your needs. Great service and advice from technician. Great service, especially that i’m A new customer. Lots of information. Always receive the best service from Cantu Pest Control. We really appreciate the services offered by Cantu pest control. We bought a house this fall and quickly learned that it had a serious roof rat problem (not to mention roaches). The Cantu team quickly secured the perimeter, making sure no more rats could come in, and set traps. Cody has been out many times and has been working persistently to hunt down one last stubborn rat in the attic. We appreciate the return visits, all for the price of our quarterly service, and the kind manor of Cody and the team. We feel confident that Cantu has our roof rats and roaches under control and we're always grateful when they come by. The keep the promise and I like James attitude. Service technician is always on time, courteous and professional. Would highly recommend this service. Ive used them for many years. They have been doing a great job! Very reliable! No problems since we started using them. Very pleased with the service. Always polite and professional. Arrives as scheduled. Excellent service, professional service people that always give a complete explanation of the service performed. Prompt to response and got rid of all the insecticides. Technician was thorough, friendly, and helpful. Excellent customer service. Ants were dead the next day, and have not come back. Great Company...Rates and Service that say "they care". We were extremely happy & impressed with the customer service & knowledge we received by Cantu’s office staff & the exterminator that came to our house to take care of our pest problem! It has been two month now getting the service from your company. So far its under control, please keep up the good work. Cantu pest control is always happy to help and their service technicians are always friendly! Cantu is the best.....before speaking with them I had one of their "competitors" come out and give us a quote and the price was more than triple what Cantu charged us. They came out assessed the situation, gave us fair price, then followed up with quick service. 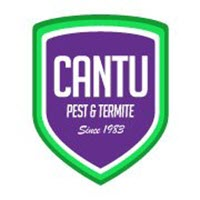 If you're looking for someone that's reasonably priced, and highly knowledgeable of pest control I would choose Cantu. Before Cantu we had another pest control company come out to our home and tell us it was going to cost $20,000 to get the mice in our attic under control. This is our first home as a newly married couple and their consultation left us shocked and terrified. My husband came across Cantu online and they came out that same day. They were so kind and talked us through their process patiently answering all of our questions. They quoted us an incredibly reasonable price for their services and have continued to come by weekly over the past month to check the progress. The number of mice in the traps have steadily declined and this week there were none. I can't imagine if we had gone with the other company. I highly recommend Cantu and their very professional, qualified team. THANK YOU. Thank you for keeping my house protected from critters, yet safe for my pets. Franchisor to LA Crawfish(18+ store units) here. Terminated our relationship with our other Pest Control Company of 8+ years to give Cantu Pest Control a 1-year run at my corporate store before adding them to our approved vendor list for the entire franchise system. RJ their sales rep was good, their technician was good, then RJ was terminated. The remaining staff contacted me later on to inform us that we were on a month to month contract which is untrue. My team and I were under the assumption that we would try Cantu out for 1 year on a monthly service contract. I paid the initial $150 dollars and assumed the remaining months would be $75 as RJ stated on the phone which I agreed to. They now want me to sign a written agreement and pay another $150 dollars to start the contract over since RJ or whomever never communicated to them that I was on a 1 year contract. They refused to honor what their ex-employee agreed to and accommodate their clients. They definitely lost my business, my other 17 stores, and the potential for a loyal client (my last company was 8+ year long relationship). They also claimed that I wanted just a 1 month trial run which they claim they have on some email communication between myself and RJ. I checked my email records and found no such thing, I told them to pull up their email records and forward to me so I can verify that they are right, and I am wrong. They put me on hold and later came back on the phone and said there was some technical error and they could not locate the emails with what they claim I had written. I use Cantu for my home and business. They always do a great job! Excellent, efficient & professional- Cody is awesome🏆🏆🏆🏆🏆🏆🏆🏆🏆🏆🏆‼️. Never had such excellent service from a business. They are like family to my home!!! Alice, Tony, and the rest for the staff are amazing !!!!! Michael was on time, friendly and sincere. Totally satisfied with the service that we received from Cantu from start to finish. I was very pleased how they took into consideration the fact I am allergic to spiders. They did an awesome job. Prompt and thorough first visit with questions answered by Michael. Great service! We’ve used this company for many years and have never had any insect issues! The price is very competitive as well. I’ve had many companies ask me to switch, and none could ever persuade me!